Weeks ago I posted my tentative schedule for this convention, promising to post an update when things firmed up some. That’s what you’re looking at now, and you’ll see that almost nothing has changed (though now I have room assignments for you). That says a lot about the folks handling programming. Well done. Not content to rest on their laurels, all of a day after I had my initial scheduling information they loaded me up with their online scheduling utility. So, I’ve had this a bit and wanted to wait in case they had any last minute changes. Sorry, that’s not their style, they got it all right the first time. So now, without further ado, here’s were you can find me during my Author GoH gig at VancouFur. 3:00 p.m. – 4:00 p.m. | Fraser | Klingon Language! Come by and ask questions or just listen to me tell stories from more than two decades of spreading Klingon around the world. I talk about language and linguistics at almost every convention I attend, and it’s never the same thing twice because language is so awesome! I’ll read a bit from the sequel to Barsk, and then answer your questions about that book, other stories, novellas, and novels I’ve written, about writing in general, or most anything you want to ask me. I’ve sold short stories to a couple dozen small press anthologies. My first two novels came out from a small press. I run a small press of my own. And I’m on the Board of Directors for SFWA where we talk about small press contracts and such. So, come by and let’s kick around some of the pros and cons of small press publishing. This seems like a good thing for me to attend. I’m a big fan of dinner. What’s portion size like in Canada? If you sit next to me, can I eat off your plate too? I expect to be in attendance, likely because I ate too much at the dinner to be able to move yet. (It’s your fault. I can’t believe you let me eat off your plate like that). 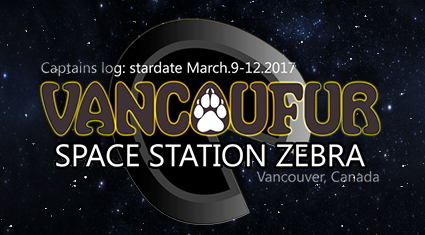 The fine folks at VancouFur have graciously provided me some space to hang out and answer questions about the Science Fiction and Fantasy Writers of America for anyone who might be interested in what they do, what resources they make available, what the perks of membership include, and what you can avail yourself of without even joining! So come on by. When I’m not doing programming, I’ll likely be drinking a Diet Coke, wandering around in the public spaces, chilling at the bar, or possibly typing away frantically on a tablet (in either a public space, or the bar). Feel free to come over and say “hi” if you like. In early March, I’ll be traveling to Canada. Specifically to Vacouver, British Columbia, where I have the privilege of being the Author GoH at VancouFur. 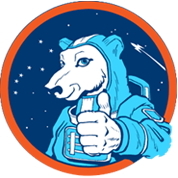 I’m especially excited to be going as this will be my first Furry convention! 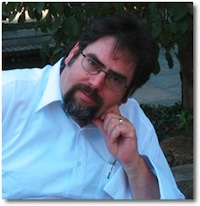 3:00 p.m. – 4:00 p.m. | Klingon Language! I’ve asked the convention if they could perhaps find some space for me to hang out and answer questions about the Science Fiction and Fantasy Writers of America for anyone who might be interested in what they do, what resources they make available, what the perks of membership include, and what you can avail yourself of without even joining! So come on by. Don’t look for me in the greater Philadelphia area come the end of July. I’ll actually be at the other end of the state. 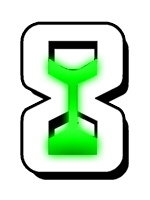 For the first time ever, I’ll be attending Confluence, which this year runs July 29 thru 31st. Even better, I’m one of the convention’s GOHs — which means someone else is providing me with Diet Coke! Confluence’s featured author guests discuss the many things in their writerly careers they have done badly, backwards, or just plain wrong. NB: Authors are professionals, do not try this at home. Emcee Kevin Hayes will introduce the Confluence guests of honor and special guests. There may be singing and tomfoolery. A standard theme in SF is the challenge of communication with an alien intellect. This is often treated as a novel enterprise. But humans have millennia of experience communicating with nonhuman intelligence. We have coevolved and can communicate with domesticants, commensals, prey, and predators. Experts in interspecies communication through shared work can cast insight into the bridges and the barriers with new and newly encountered form of nonhuman intelligence. What are the pros and cons of bringing in anthropomorphic characters in lieu or in addition to traditional aliens in science fiction? GOH Lawrence M. Schoen discusses how the nonhumans in his novel Barsk: The Elephants’ Graveyard resonant better than aliens. An introduction to the Klingon language. No one will be admitted during the voiced velar fricative portion. Warning: There may be elephants. Oh, who are we kidding, of course there’ll be elephants. Also Q&A if desired. Of course, we are a month out, and anything above could change. I will likely post a “final” schedule a week or so before the convention. Klingons and Elephants and Audiobooks, Oh My! I’ve been keeping this under wraps for a while, but now the tale can be told: The audiobook version of my novel, Barsk: The Elephants’ Graveyard, will be read by none other than the brilliant actor and director, J. G. Hertzler. 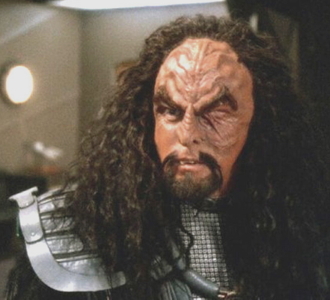 That’s right, folks, Martok, the galaxy-renowned one-eyed Klingon General, spent much of last week in the studio, tankard of bloodwine close at hand, to record the tale of prophecy and intolerance, loyalty and conspiracy, friendship and the dead. And when you think about it, who better than the Klingon warrior who survived the Dominion War and emerged to lead his people to glory.